I feel so lucky, talk about luck! I scored the Vitality VoxBox from Influenster. I received 6 items complimentary for testing purposes. If you don't know what a VoxBox is, it is a box full of goodies. 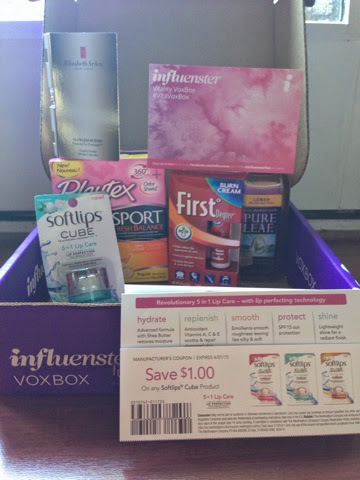 In my Vitality VoxBox there was a tube of First Degree Advance Burn Cream, 1 box of Playtex Sport Fresh Balance tampons, 1 sample size of Elizabeth Arden Flawless Future Powered by Ceramide Caplet Serum, 1 bottle of Pure Leaf Iced Tea, 1 Softlips Cube,with coupons, and a sample pack of Bikini Ready Energy Gummies. My favorite item in the box was the Softlips Cube. I loved the design of the cube. I like the cubed design instead of of a stick. When applying the cube it is much easier to apply to the inner part of your lips. My sample was the Fresh Mint. The flavor was not over powering by smell or taste, it was just perfect. I defiantly will be buying the Softlips Cube again. My second favorite was the the Elizabeth Arden Flawless Future Powered by Ceramide Caplet Serum. I am always on the look out for products to fight wrinkles. I really liked this product. I like how it helped reduce my early signs of aging from those little lines around my eyes. The First Degree Advance Burn Cream really surprised me. I did not know that a burn cream could help razor burn. I always get razor burn around my bikini line. I loved how it helped with the burning. This product will be a must have next bikini season. What summer would not be complete without drinking Pure Leaf Iced Tea. This tea is made from real brewed tea which gives it its fresh brewed flavor. I just love sitting out back relaxing with a good cold bottle of this tea. I also received a box of Playtex Sport Fresh Balance. Who can get excited about a box of tampons. I am excited that I got whole box for free to try. I really liked them. I felt secure within my work out knowing that I would be free from an embarrassing stain. The last item in my Vitality VoxBox was the Bikini Ready Energy Gummies. As a mom to a toddler, I still do not get hardly any sleep, so when it comes to working out I have to drag myself, because I have no energy. After trying my sample packet I felt like I had energy and I wanted to work out. These gummies had b-12 in them that act as a energy booster. Talk about a pick me up, it really helped this mom. I just wished I received more. I loved everything in my Vitality VoxBox. Would you like to receive a VoxBox? If you would like to be lucky and receive a VoxBox leave a comment and I will send you a invite. I want to thank Influenster for letting me sample these products.